One of the biggest problems that I’ve had with this show is very little progression on an overarching villain. There have been hints of “Centipede” here and there and a couple minor threads coming back again, but nothing serious. At least until now. This episode brings back Rayna, the girl in the flower dress as well as her mysterious boss who was in prison and gets busted out at the beginning of the episode. He has a bit more personality here, but he feels like they’re trying too hard to make him a quiet badass akin to Kevin Spacey’s John Doe in Seven, but the actor is no Kevin Spacey. Centipede now has three super soldiers at their disposal, with some extra centipede implants all over their bodies. They’ve fixed the exploding problem, but the effects are still temporary. Except, of course, for Gunn. I’m sorry, I mean Michael who has kept his powers, his centipede, is now training to become a S.H.I.E.L.D. Agent, and is coming along for the ride. This was a much better thread to see and it also gives a chance to give the agents a little super powered action for a change. There are also quite a few quieter moments that help drive the characters forward. I haven’t been a fan of Skye’s storyline where she is searching for her parents which has been covered up by S.H.I.E.L.D., both Coulson and May know what the truth is and they are hiding it from her on purpose. There are also some hints that Skye may actually be Coulson’s daughter, but it’s too early to tell if that’s the direction they are actually going or if it’s merely a red herring. Coulson talks to Ward about his previous love that he had to leave behind after his return from the grave. She was a cellist. He also has a poignant conversation with Michael about his son that he has been avoiding ever since he was overcome by rage in the first episode. Coulson tends to get a lot of these kinds of speeches, but I’m not sure if I’ll ever get tired of them because he is so damn good at delivering them. And the final cliffhanger is pretty climactic and leaves quite a few questions as to how they will be resolved. I do hope that Michael survives because I think he would be a good addition to the cast, even though there are already two heavy hitters with Ward and May, and things don’t look too good based on previews for the rest of the season. And I mention Declassified here a lot, but this time around there’s actually a full half hour episode that includes a fun talk with some Q&A and some silliness with some of the cast and a couple behind the scenes women including Melissa Tancheroen, Joss Whedon’s frequent collaborator and co-creator of the show. If you haven’t been watching it, now’s a good chance to check it out at ABC.com or on Hulu. Until next time, this has been Bubbawheat for Flights, Tights, and Movie Nights. 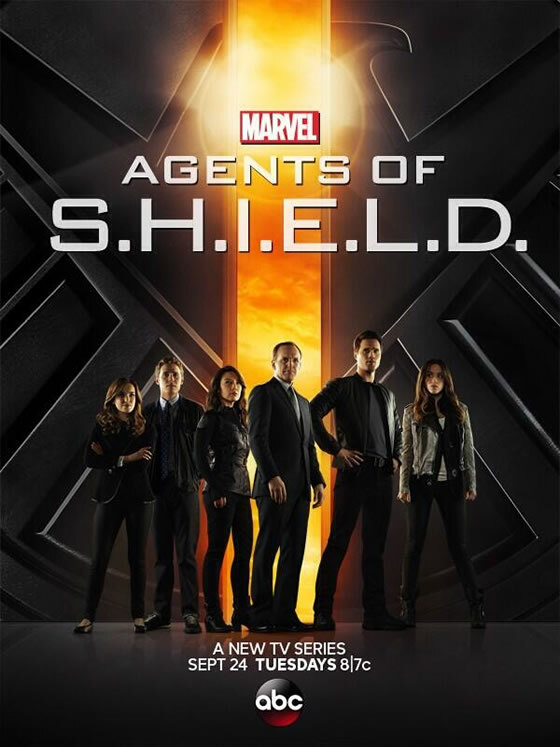 Posted on December 11, 2013, in TV Nights and tagged Marvel, review, SHIELD, television, tv. Bookmark the permalink. 9 Comments. If this episode didn’t get you interested, then I doubt anything else in the upcoming episodes would either. Maybe their Netflix shows will catch your interest. I’m still waiting for this show to really kick it into high gear, but this episode was a lot more like what I was hoping for. Felt a little more like a “world of superheroes” than “X-Files in a plane”. About the mid-season hiatus thing… I think that started in the early 2000s. I remember 24 was one of the first to get that treatment, and I remember Keifer Sutherland becoming really pissed off about it. The gap led to such a big drop in the ratings that Sutherland put a clause in his renewal contract that they couldn’t do it again. I remember shows going on hiatus for a while now, but I was wondering when they started hyping the episode before the hiatus as a “midseason finale” which seems like almost all full season shows do now. And in the marketing, especially on Twitter, they’re using the somewhat catchphrase of “it’s all connected” which has me hopeful for a more interconnected second half of the season, and more super couldn’t hurt either. I’m really enjoying this show. It’s pretty much been either exactly up to, or better than, my expectations every week. I can see why some would be disappointed in it so far. I think there were a lot of high expectations for some folks going in. But c’mon. It’s a network show set in the Marvel Movie Universe. The simple fact that I don’t throw a sock at the TV screaming “That looks like something that crawled out of my cat’s hole!” surprises me every week. I’m with you, there’ve been a few times where it’s dragged a bit, but for the most part I’m happy with the direction it’s going and am looking forward to the rest of the first season. I though something quite similar, it’s not like that semi truck pulled up after he got into position, it was already there.